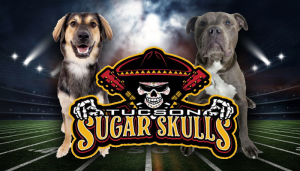 The Humane Society of Southern Arizona is teaming up with Tucson's newest sports entertainment extravaganza, Tucson Sugar Skulls indoor football, for a "bring your dogs to the game!" event on Sunday, April 14th. Kickoff is at 3pm at the Tucson Arena downtown - but the fun starts well before that! The Tucson Sugar Skulls return to the "boneyard" at the TCC arena for the third home game of their inaugural season this coming Sunday, April 14th against in-state rivals the Arizona Rattlers for a key Indoor Football League matchup. The fun starts at 1pm with an outdoor tailgate and community celebration featuring your Humane Society of Southern Arizona, onsite with wonderful adoptable dogs from 1 to 3pm. Already have a dog? GREAT - bring them to the game! For just a $5 doggie ticket (available only at the TCC box office) you can bring your leashed and well-behaved canine pal to the Sugar Skulls game with you! And that $5 is being collected and donated to the Humane Society so we can continue our great programs for pets in our community.